The term microlearning has been around for a while, but it’s more than just a buzzword. It incorporates a whole array of learning techniques, each of which have been around – if not well-articulated – since the beginning of time. So, what is it really? In essence, micro learning refers to the strategy of designing short learning resources and delivering them over a period of time. How short these resources are, what medium they use, and when, how and how often they are accessed, all depend on what you deem to be appropriate and effective, and the best fit for your learning infrastructure. 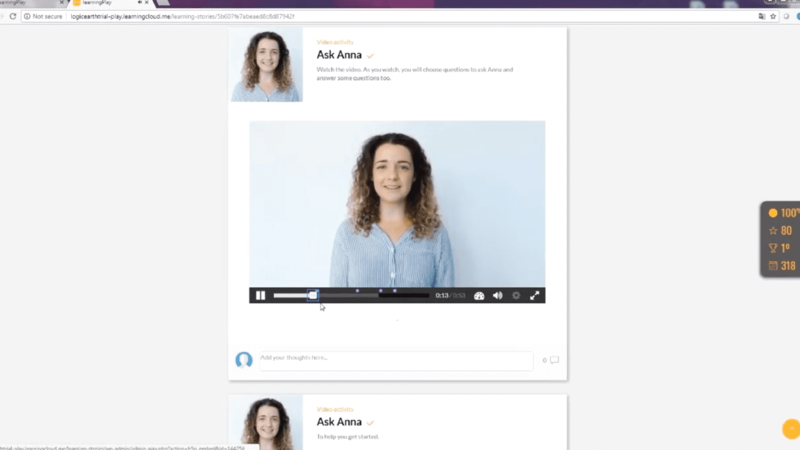 Microcontent is the name now given to those short, focused bite sized chunks of any digital learning solution. How micro is microcontent? We like to think of each piece of microcontent as being a “single-outcome” resource as a good rule of thumb. If, having completed it, a learner had learned the one small thing that piece of microcontent was created to explain or show, then that’s a good outcome. Now, what if you could repeat that short bit of learning again for the learner in the not-too-distant future, and perhaps again after that? Add to that an opportunity to practise applying this new knowledge to a situation. This is where spaced repetition, or spaced practice, comes in. Many new Learning Experience Platforms have built-in algorithms that automatically deploy microcontent at strategic moments over a period of time. This provides learning interventions for learners in the key areas where they need a certain sustained level of knowledge. Click here to read about our LXDs’ take on spaced repetition. Basic AI has already crept into online learning. We’re already all familiar with chatbots and instruction from a ‘human’ computer voice. But intelligent algorithms are being built into learning systems, analysing results and making intelligent decisions. The algorithms are learning and deploying changing strategies and will only continue to grow in complexity, allowing adaptive learning to become more sophisticated. They are going further than personalising a learning solution based on test results. They look at the ability of learners to apply knowledge to real life scenarios and at the confidence demonstrated by learners in doing so. In this way, intelligent software can now identify where learners fall short of having required skills and knowledge, and can tailor a learning path through necessary content. Platforms that support personalised learning programmes are finally catching up with the concepts of spaced practice and adaptive learning. The built-in intelligence can be constantly assessing each individual learner’s competence, and the tool will bring them along a unique learning path. 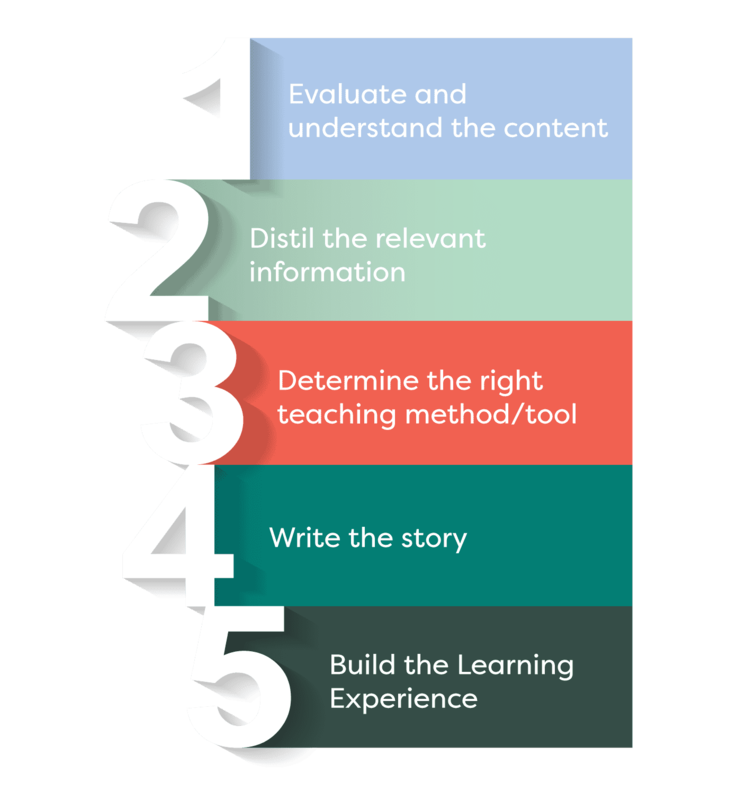 Your small chunks of relevant, digestible content are served up to each learner at regular intervals. Key information is repeated and reinforced, and new topics are introduced at an appropriate time. Competent learners can be fast-tracked through a learning programme. Learners that need more time and opportunities to learn are also catered for. The customisation of these deployment schedules provides for human intervention when necessary. For strategic L&D professionals, this results in highly focused, efficient, engaging and smart learning programmes for learners with varying needs. In the past it has been challenging for organisations to effectively implement spaced practice strategies. These strategies relied heavily on manual and time-costly efforts, and had a large initial time investment to plan resources and schedules. There is a growing ability of platforms to manage the auto-deployment and timed delivery of microcontent in an appropriate manner. It has resulted in the focus of learning solutions to shift – rightly – to the learning outcomes and to the quality of the content. This is allowing L&D to facilitate true performance support. The advance of AI has given rise to powerful analytics in relation to online learning. Now we can see so much more than who has completed a course. And it’s no longer about achieving 8 out of 10 in a final assessment. It’s now possible to properly gauge how effective the learning is. 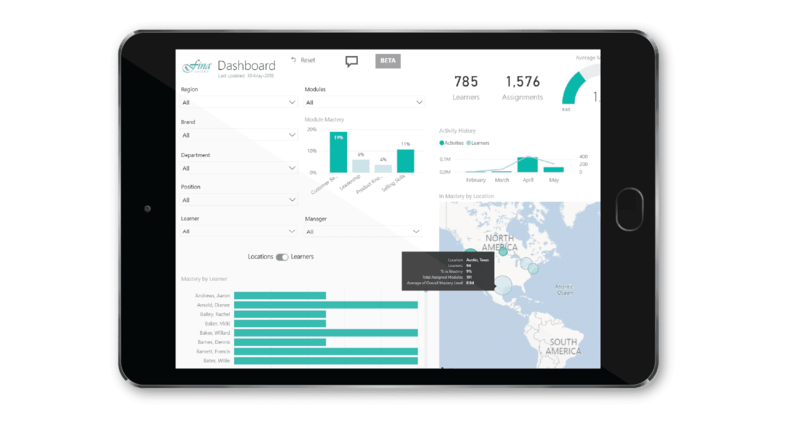 Dashboards now show the topics and subjects that are important for learners to be good at their jobs – as identified by the Subject Matter Experts. They show the actual competence and confidence levels demonstrated by learners in these areas. This will highlight the real skills and knowledge gaps (read our blog on how to use online learning to identify skills gaps) and provide real data on which to focus effective learning strategies. It could be the key to “doing more” with an already reduced budget. It might help make an indisputable business case for the development of crucial or more in-depth learning resources. 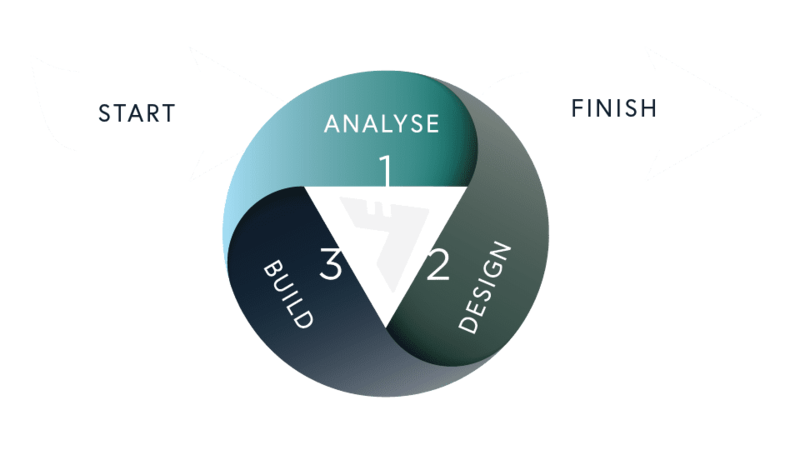 A microlearning solution also comes with the benefits of an agile development process and is flexible and scalable in nature. This brings time efficiencies and cost control and the ability to roll out training quickly. An agile approach to development will enable an L&D department to respond quickly to business needs. It can drastically reduce the time training takes to reach the learner, providing both short term and long term gains. An engaging microlearning solution might include lots of different types of microcontent. Short videos, animations, conversations, diagrams, images, infographics, interactions, text explanations, assessment questions, scenario questions, to suggest a few. These assets can sit independently and be deployed to your learners from within the appropriate learning environment. They will sit happily on mobile devices. You might want to adopt some small aspects of microlearning, that would complement existing learning programmes. You may have a blended learning programme in mind, and can see within it a place for microlearning. 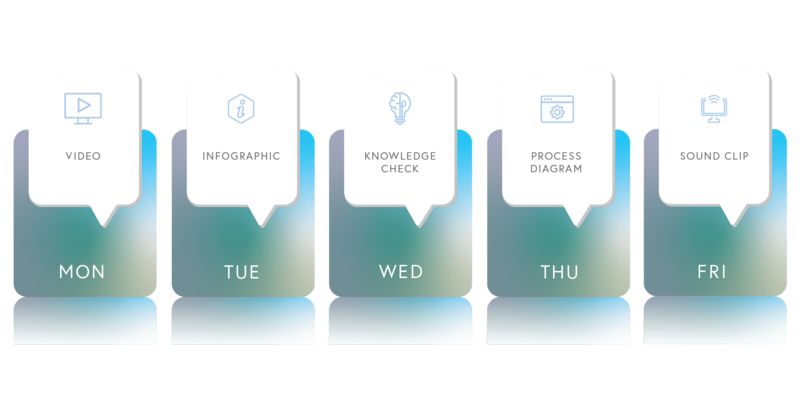 You may be as excited as we are about a full microlearning strategy, with its adaptive layers and powerful analytics. 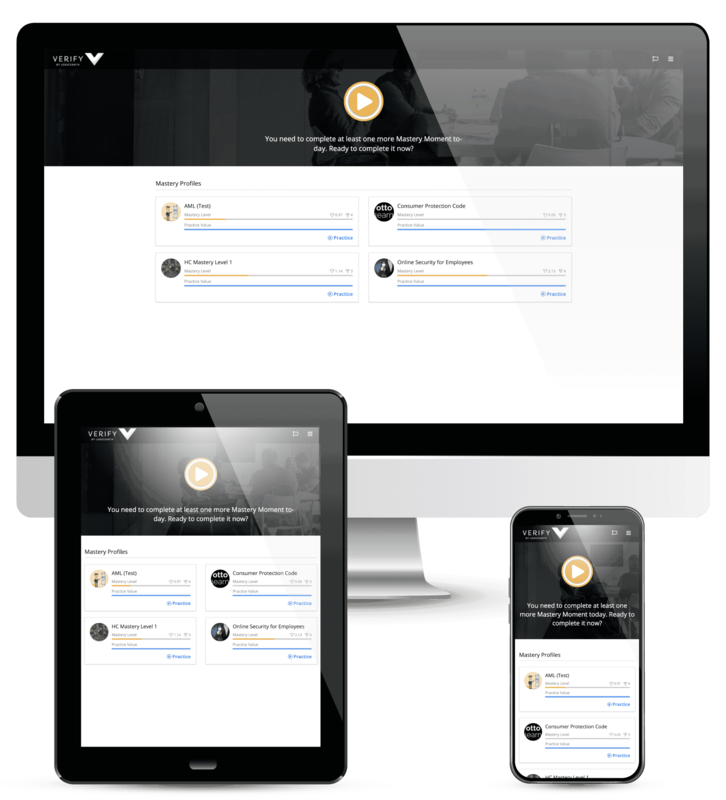 You believe it could revolutionise all your online training, including replacing your old compliance training. Whatever way your organisation might embrace microlearning, it’s hard to argue against the effectiveness of good, well-crafted microcontent (read our blog on applying microlearning principles to traditional eLearning). Regardless of the authoring tool, microcontent can be deployed as standalone learning resources. Growing skills through a microlearning solution isn’t going to happen any faster. However, user engagement tends to be much better when the content is delivered in a less intimidating, less onerous fashion, fitting in with busy timetables. Microlearning isn’t the answer to everything. There are, of course, areas where macrolearning and macrocontent is more appropriate (e.g. larger topics where context and flow are very important). But understanding the options for learning solutions leads to more discerning choices when it comes to the challenge of meeting the needs of modern learners. Don’t get too hung up on what a microlearning solution is or has to be. Understand what its principles could mean for your organisation, and then decide to what level you might apply them.